Sunday January 8th 1922 Was in bed most of the day. Got up to eat dinner. The folks went for a ride in afternoon. Will & Carrie Anderson here. Rob & Cora to the store. Hattie and I had supper late. Ott & Fannie here. Monday January 9th 1922 A beautiful day. The girls washed in forenoon. I was in bed the most of the day. Hattie away in PM. John & Callie McCallister here. Tuesday January 10th 1922 Rob & Cora drove to Cedar Rapids for the day. I was up part of the day. Frank & Mollie Stevens called. The folks went to a play in the evening. I spent the evening reading. 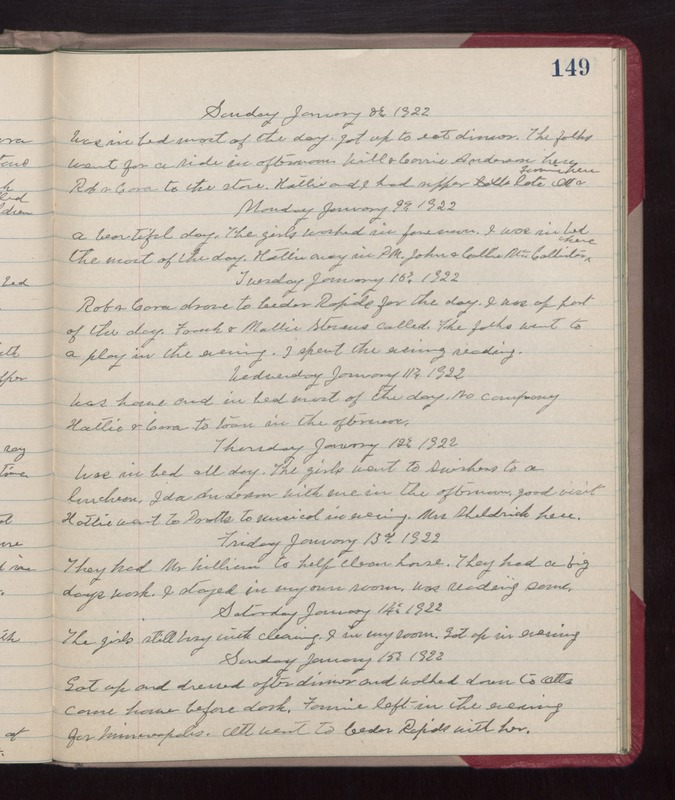 Wednesday January 11, 1922 Was home and in bed most of the day. No company Hattie & Cora to town in the afternoon. Thursday January 12th 1922 Was in bed all day. The girls went to Swishers to a luncheon. Ida Anderson with me I the afternoon. Good visit. Hattie went to Pratts to musical in evening. Mrs Sheldrick here. Friday January 13th 1922 They had Mr William to held clean house. They had a big day work. I stayed in my own room. Was reading some. Saturday January 14th 1922 The girls still busy with cleaning. I in my room. Got up in evening. Sunday January 15th 1922 Got up and dressed after dinner and walked on to Otts came home before dark. Fannie left in the evening for Minneapolis. Ott went to Cedar Rapids with her.